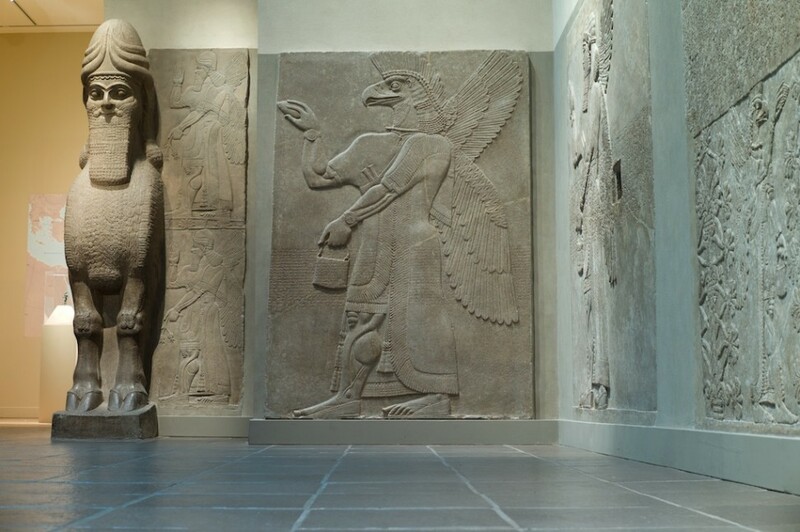 It’s a Guardian, Lamassu, and to the right is a narrative of the God, Marduk. The sculpture has texture and patterns that are carved into the stone. You can see some lines on the sculpture as well. The function of the lines are to make the figure of Marduk visible and they provide some kind of order to the composition. The relationship of shape to space in the work is that there is space around the sculpture, which provides a sense of depth. There are many shadows on the sculpture like between his legs, and there are light areas, creating a tonal contrast on the artwork. The colours of the sculpture are monotone because the primary material used to create the object was stone. The attention is drawn to the pattern on his breast. The legs provide a sense of symmetry, and the beard and the breast shows rhythm. It looks more disjunctive; it is constructed by many different pieces. The sculpture provokes fear. It evokes fear when you stand in front of it, but on the other side protection. This sculpture is held at The Metropolitan Museum in New York, standing at 10 feet and 3 ½ inches It was first found 1km from the Assyrian temple of Noomanea in Iraq, in 1845. It was made out of white limestone, in 3000 BCE, by a king, named Ashurnasirpal,to protect the doorways in the Assyrian temple.